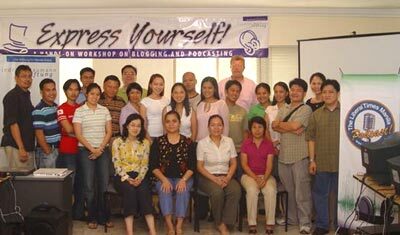 Eighteen highly motivated blogging and podcasting novices from all parts of the Philippines assembled at the premises of the liberal Foundation in Makati City on July 4-6, 2006 for a second run of the successful Express Youself! workshop. Joining the Filipinos were participants from Indonesia and South Korea. During the three-day hands-on training, which included sessions on all important strategic, editorial and technical dimensions of the new digital media, all participants published their own blogs and podcasts. As in the first activity in March 2006, prominent Filipino bloggers shared their knowledge: Manolo Quezon III presented an overview of blogging and podcasting in the Philippines, and Abe Olandres and Angelo Racoma delivered step-by-step tutorials for the production of blogs and podcasts. "As the facilitator of the event, I am happy with the outcome and also full of praise for this dedicated and highly motivated group of Filipino neo-bloggers. On more than one occasion these past three days I heard participants say that they were not only learning a lot but also having fun. Learning and having fun at the same time is, in my eyes, the very essence of effective civic education."